Considering a swimming pool this year but aren’t sure what the different pool bottom descriptions mean? 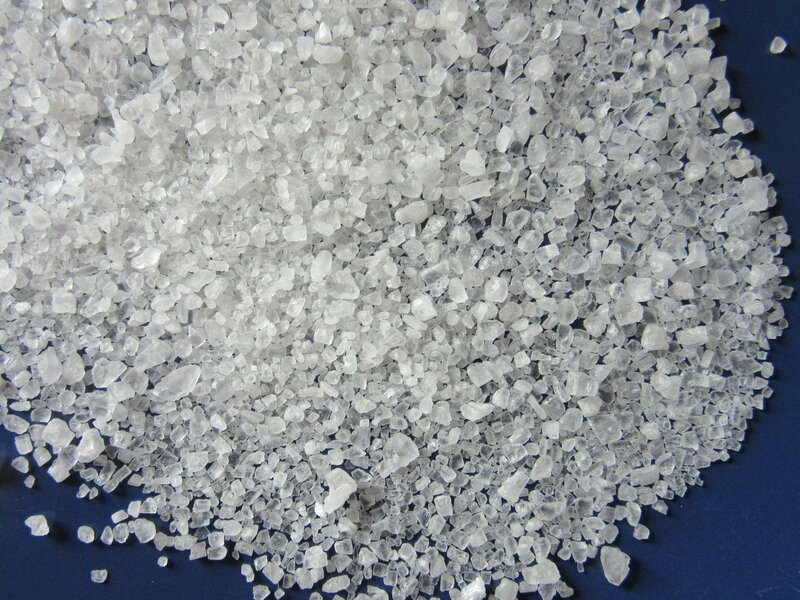 There are a few standard bottoms to choose from, here is a list of those common pool bottoms: Standard, Wedge, Sports, Play, Flat Bottom, and Coved Flat Bottom. This is the most common type, after all- it's standard for a reason. The pool bottom has a good-sized shallow end, a transition slope down to the deep end, a flat hopper (deepest part of the pool), then a slope back up to the deep-end wall. Please see the diagram. The hopper/deepest portion is designated by the solid blue rectangle in the diagram. The lines inside the pool designate the edges of the transition, back, and side slopes which extend from the height of the pool panels (typically 42” or 48”) down to the hopper. The wedge is a unique design. The wedge pool can be made with either a small flat "landing area" in front of the step, or with no flat sections at all. It has a very mild, gradual slope from the shallow end wall all the way to the deepest point where, instead of having a flat hopper section, the pool simply slopes back up to the wall. Think of this more like how you enter the water at a beach; slow and steady. This type of pool bottom is very popular among those who play pool sports such as volleyball or water polo. 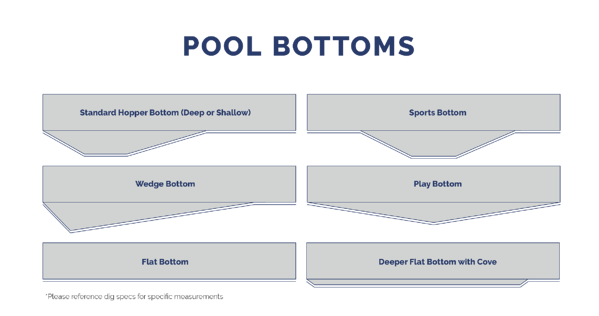 In the sports bottom pool, there is a flat shallow section on both ends of the pool. After the shallow sections on both ends, the pool slopes down to a small hopper in the center which is typically around 5’ to 6’ deep. This type of pool is not as deep as a diving pool, therefore it heats faster, as is true with all shallow pool types. ends of the pool down to a deep point in the center. The deep point is typically about 5’ to 6’ deep. The next two types of pool bottoms are very similar, one is the flat bottom and the other is a deep flat bottom achieved with a cove. The flat bottom pool is quite simply a flat even surface across the entire pool. A flat bottom pool with 42” wall panels will be 36” deep (Wall Panels are 42”, with a Pool Base built up 2”, and a water level typically 6” below the top of the pool wall). With this same logic, a flat bottom pool with 48” wall panels will be 40” deep. If you’re planning on using your pool primarily for swimming laps or playing simple sports like water volleyball, a flat pool bottom may be just right for you. 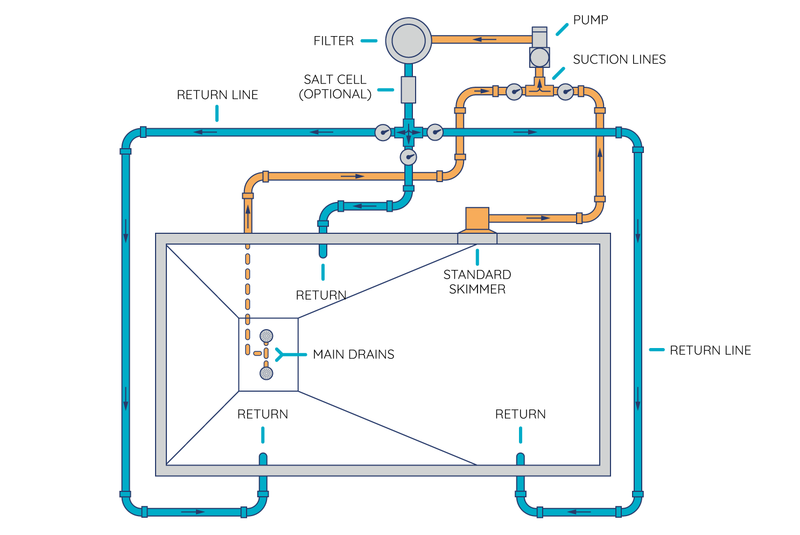 Plus, since they are one continuous depth, generally the height of your pool walls, there is much less digging required to install a flat bottom pool, making the the easiest to install out of all the different options. 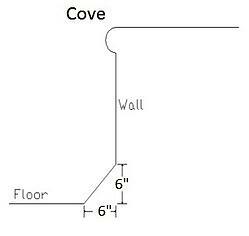 The cove-method is a very easy way to achieve a deeper shallow end or deeper flat bottom with a 42″ or even a 48" panel. Instead of the pool bottom being completely flat, there will be a 'cove' that is basically a slope away from the wall down to the desired, deeper, shallow-end or flat bottom depth. Length of the cove will depend how deep you would like the shallow end or flat bottom. The only other consideration when choosing to cove the shallow end for a deeper shallow end is that you will need to also shape a “ramp” in front of the step so there is something to step onto when you get in the pool. Please see the diagrams for more information. 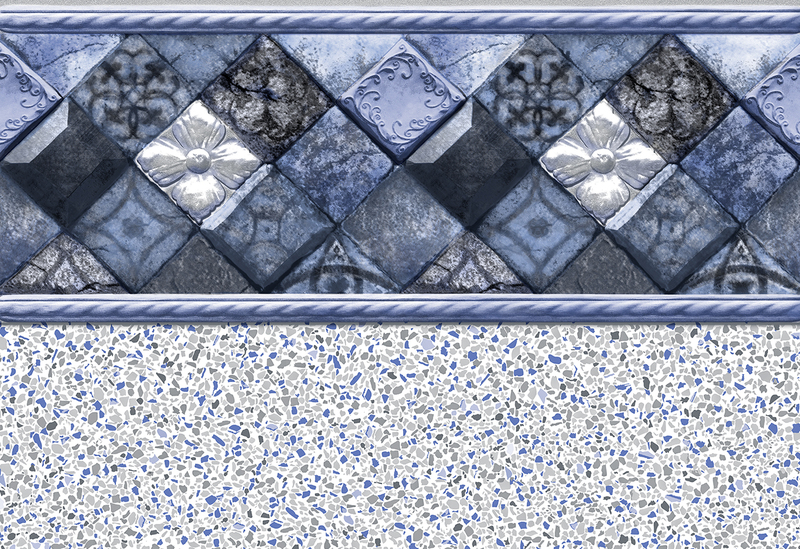 Keep in mind that we can also customize your pool's bottom if you have something in mind that you're not seeing listed.